The Lisa Parker Collection catalogs some of the most beautiful nature-themed designs from her works. Anonymous Mint partnered with the Osborne Mint, America’s oldest operating private mint, to strike these beautiful silver rounds. Today, 5 oz Antique Silver Lisa Parker Collection Moon Gazer Rounds are available to you online at Silver.com. Available to ship inside of protective plastic capsules with a Certificate of Authenticity included! Third silver round in the Lisa Parker Collection! On the obverse is the design of Moon Gazer. On the reverse is the image of Wild One, the common reverse for the series. Designs created by Lisa Parker. Art chosen for the series by Julie Lindquist. Antique polish applied to each round! Lisa Parker’s works are all inspired by her love of nature, the outdoors, and the mystical realm. Using contrasting lighting and composition, she creates beautiful works of art that draw the viewer in with each new piece. Originally using colored pencils as a child, she eventually moved on to try out various mediums that included oils and watercolors. All of these 5 oz Silver Antique Lisa Parker Collection Moon Gazer Rounds are available to you with a protective plastic capsule and individually numbered Certificate of Authenticity. The antique rounds in the series have a distinctive polish added that creates an heirloom-quality finish with a matte, rustic appearance. 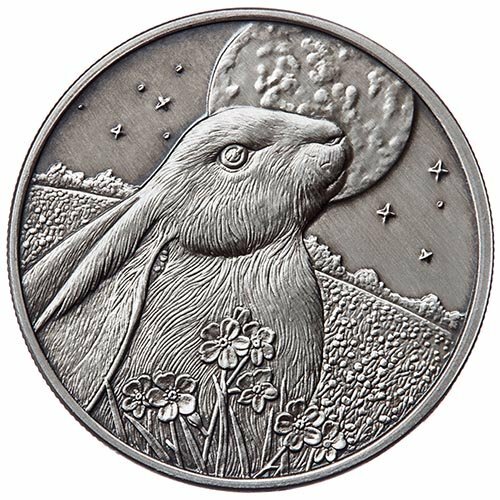 On the obverse of each Silver Antique Lisa Parker Collection Moon Gazer Round is the image of a rabbit looking up at the moon overhead. In this design, the rabbit sits in the foreground with its ears pinned back and its head tilted up toward the moon overhead. The background field includes rolling hills that disappear into the distance. 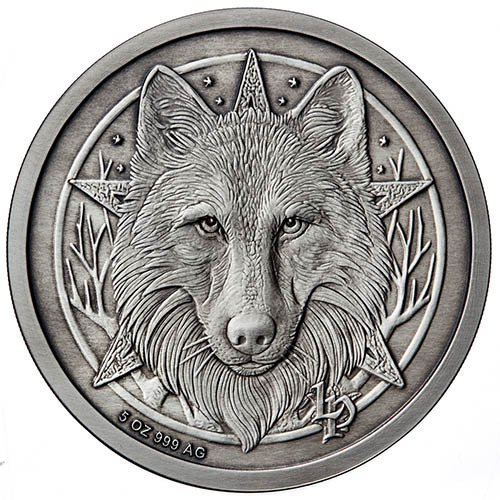 The reverse face of the 5 oz Silver Antique Lisa Parker Collection Moon Gazer Round includes the common design element used on all rounds in the series. This vision of a wolf’s head with a five-pointed star behind it is known as Wild One and is among her most popular works. Julie Lindquist of the Anonymous Mint hand-picked the designs in the new Lisa Parker Collection. Each design was hand-sculpted onto dies for the production process by Italian Master Sculptor Luigi Badia. Anonymous Mint provided the designs to the Osborne Mint for the coining process. Please don’t hesitate to reach out to us with your questions when buying silver. You can call Silver.com customer service at 888-989-7223, connect with us live online through our chat service, or simply send us an email with your inquiries.